3 bedrooms, sleeps 8, direct lakefront! Clarke's Landing is newly built 2 story house with heat and air conditioning! It is a family home and has all the amenities that you would have at home.Everything is NEW! It includes cable and WiFi internet, new quality linens, paper goods, shampoo,spices, beach towels, chairs , floats and coffee. The first floor has a fully equipped kitchen, living room, dining area and bathroom with shower that opens to a deck with seating area and gas grill. The kitchen is complete with everything you will need to make yourselves right at home. It has a dishwasher, microwave, gas stove, refrigerator with ice maker, toaster, blender,cake pans, salad spinner, etc. The dining table seats 8 and the living room has a gas fireplace and new comfortable sofa and cable TV. It opens to a deck with table and chairs and umbrella. The bathroom with shower can be accessed from inside the house or directly from the deck for guests. There is a shared laundry room with washing machine and dryer also on the first floor. The second floor has 2 bedrooms and loft bedroom. The first bedroom sleeps 2 in a king bed and has a private bathroom with shower, bedroom 2 has a queen bed that sleeps 2 and shares a guest bathroom. The loft area has 2 single beds and 2 bunk beds that sleeps 4 and shares guest bathroom with shower. Rental includes beach passes for the public swimming area across the lake. 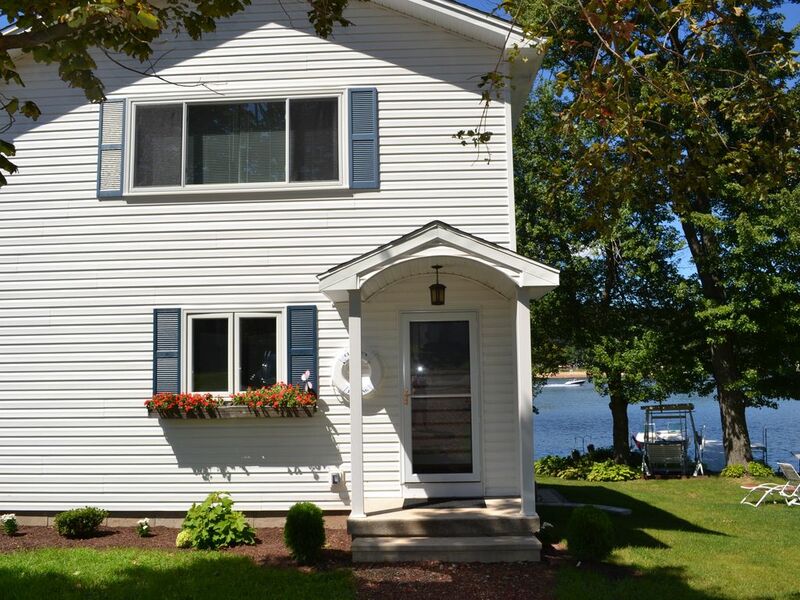 There are 2 docks, one is a short swim away and the other is adjacent to the property for boat access.Easy access to Hartford, Middletown or New Haven, scenic drives,casinos, and antiquing. Close to Wesleyan University and 21 miles to the coast. 5 minutes from Powder Ridge Ski Area. CLARKE'S LANDING IS THE LARGER UNIT OF 2 ATTACHED PROPERTIES, BOTH PROPERTIES CAN BE RENTED TOGETHER TO SLEEP 12 GUESTS. SEE BETTY'S BOAT HOUSE FOR THE OTHER PROPERTY. toilet, shower, The guest bathroom on the second floor is shared. Guests are welcome to bring Kayaks or canoes! Powder Ridge Ski area is a few minutes away! I stayed for Fourth of July weekend with my boyfriend and another couple. It was a very relaxing weekend on the water. The house is beautiful it has everything you would need. Lanna was super helpful and very responsive the entire time. The lake was beautiful as wel! Would highly recommend if youre looking for a quiet relaxing weekend. We rented Clark's Landing and the attached Betty's Boathouse for the weekend of my niece's wedding. We had a delightful stay there. I am closer to 60 than 50 and most of us were closer to 80, but it suited us well. I think a family with kids would also have a great time. The dining/living room area is lovely. It looks out on the lake and attached porch/deck. The kitchen is well equipped and we were able to make a lovely pasta and pork tenderloin lunch on the day we arrived. It is a spot conducive to sitting and watching the sky, the lake or chatting quietly. outside. Some of the 50-80 crowd even got into the lake on a chilly October weekend! We didn't end up using it but there was a grill outside. The tv worked, we actually turned it on for the debate and the wifi was good. I believe we were the first guests so everything felt spotless and new! The queen and king beds are comfortable and the rooms are lovely. The one thing I did not understand until I got there was the the bunk bed and two singles are basically at the top of the stairs. There is no door to close or privacy when sleeping. We were fine with this as we came for wedding and family. I think it would be great for kids but less great for those of us in our 50s, the beds are not super comfortable. We had a 17 year-old for only one night and luckily she took the top bunk! Rental of this property requires a rental agreement after booking.